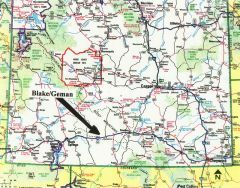 Description: One of the lowest priced 80-acre tracts with the best purchase terms to be found anywhere in the United States of America today! Own a part of the “Old West” while still available and affordable. History proves it is literally impossible to lose money owning land if purchased cheap enough and held long enough. Price: $19,920 ($249/ac) with $420 down and the balance of $19,500 payable at $195/mo (no credit checks and no prepayment penalties). 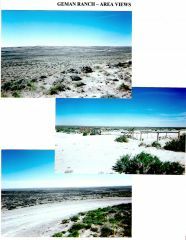 Access/Roads: This property is located in the checkerboard area (meaning alternate sections owned by private and the federal government) and access is per long standing BLM (Bureau of Land Management) policies (meaning private owners can cross BLM land to get to private property but the public can’t cross private lands to get to BLM property). An actual road, however, might or might not exist at this time. Surveys: All sections were surveyed by the federal government at some time in the past but private surveys for individual 160-acre tracts have not been completed. Zoning/Usage: The zoning is basically “agricultural” (residences are forbidden without receiving a zone change, which is problematic) and if addition uses are anticipated you should contact the Sweetwater County Planning and Zoning Dept. (307-872-3914). Directions: From Rock Springs, Wyoming drive east on I-80 approximately 40-miles and turn off to the north on Tipton Road (Exit 158); proceed north on this county road approximately 12-miles (to where the ranch begins) and refer to the parcel map wherein the arrow points directly to the parcel. Each square on the map represents one square mile (thus the parcel for sale might be located beyond the 12 miles).